After graduating from the University of Pennsylvania with a B.A., Dr. Jacobs attended Jefferson Medical College in Philadelphia and graduated in 1972. He completed his General Surgery Residency at the Polyclinic Medical Center in Harrisburg, PA and his Plastic Surgery Residency at Temple University Hospital in Philadelphia. Dr. Jacobs joined Cosmetic Surgery of NY in 1978. 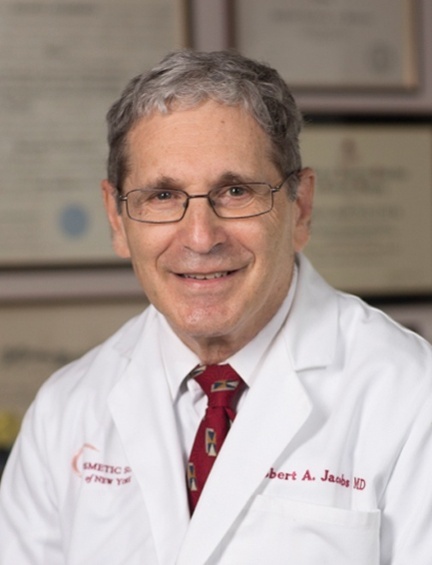 Dr. Jacobs is one of only 40 surgeons in the U.S. (three from Long Island) selected to participate in the initial cohesive gel breast implant study. Devotion to family, community and profession characterize Dr. Jacobs best. Simple pleasures and activities bring the most satisfaction. While many might assume he lives the sophisticated life of a successful doctor, he thinks of himself as a regular guy who just happens to be a (highly regarded) plastic surgeon. Commitment to community, particularly education, plays a major role in his life. He is one of the founders of the Suffolk County Solomon Schechter Day School. Although all of his children are grown, he continues to volunteer for the Port Jefferson High School Prom Construction Committee – where the entire school is transformed into the prom theme, but of greater importance, it provides a safe environment for students on that special night. He can be regularly seen about town and commuting to work on his bicycle – it’s one part exercise, two parts fun.